I have been quite happy with my fixed-up Keithley 197 5 ½ digit bench meter purchased from eBay (you can find the teardown pictures here) earlier this year. 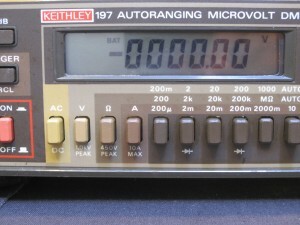 Keithley 197 has a battery pack option (Model 1978), and this option allows it to run on battery power for 5 hours without having to plug into the mains. While it is far from being a truly portable meter, its performance easily surpasses most hand-held multimeters. So I decided to build the battery option myself and hopefully I would be able to use the meter more often in places where power outlets are not available. Basically, it uses a Maxim SI7661 (now obsolete) charge pump to create the symmetric negative operating voltage (-12V). And the charging circuit is formed simply with resistors (RT101 and R101 along with the 10 Ohm resistor R131 on the main circuit board) . These resistors in series limit the terminate charging current to around 30mA. Q101 is used to limit the maximum charging current through the battery during initial charge. As the charge current increases, the the voltage drop across R101 will increase accordingly. When the voltage drop exceeds 0.6 to 0.7 V (roughly 150mA), Q101 starts to conduct and shunts the excess charging current. When in battery operation mode, the B-E junction is reversely biased so Q101 is off and does not draw any current from the battery. Because Keithley 197 relies on the regulated +10V and -9V for proper operation, the input voltage to the regulator cannot drop below certain level otherwise the circuit will loose regulation and cause the regulated output voltage to drop. This voltage drop will affect the accuracy of the conversion circuit, causing inaccurate measurement results. Thus a comparator is used to pull down pin 16 on the MCU (U114) when the battery voltage drops to around 11.6V and a low battery indicator (BAT) is then lit on the LCD. 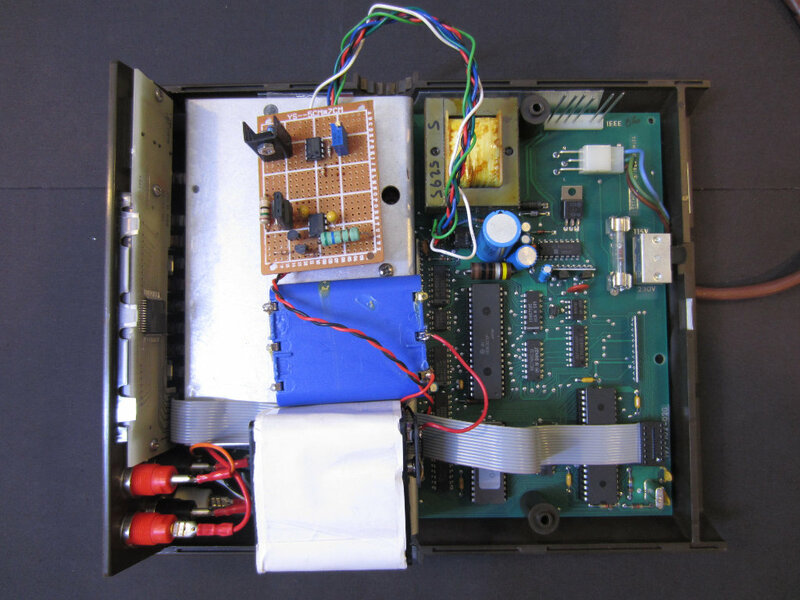 The schematics below illustrate where the signals from the battery board connector connect to the rest of the system. While the charging circuitry is extremely simple, it has some obvious drawbacks. one problem is that when the battery is fully charged, there is still some significant amount of current flowing into the battery. So when the instrument is left plugged in for an extensive amount of time, the life of the battery pack could be shortened significantly due to excessive overcharging. One way to solve this problem is to increase the value of RT101, but because of its location increasing its value will cause additional voltage drop to the voltage going into the regulator. 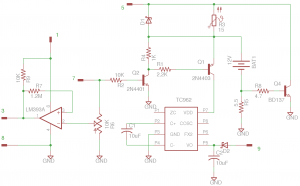 Since SI7661 is obsolete now, I replaced it with a Microchip TC962 high current charge pump DC-to-DC converter chip. A ten-turn trim pot is used in place of R103 and R104 so that the trip voltage can be adjusted easily. RT101 is replaced with a Schottky diode in parallel with a low Curie temperature PTC thermistor. The thermistor is attached to the surface of the battery pack to monitor its temperature. When the battery is fully charged the surface temperature begins to rise, this will cause the resistance to increase and thus lower the trickle charging current. When in equilibrium the trickle charging current can be reduced to lower than 10mA (depending on the PTC used). To counter the effect of the PTC resistance during battery discharge, a Schottky diode is put in parallel so that the PTC is shunted when the instrument is running on battery. I also added Q2 and Q1 to switch the charge pump on and off. In the original design the charge pump is connected to the “On” side of the power switch so that it only operates when the power is turned on. I could have used the same design here but with the introduction of Q1 and Q2, the charge pump can be turned on and off via a control signal (here I used the same 5V reference signal the comparator uses). 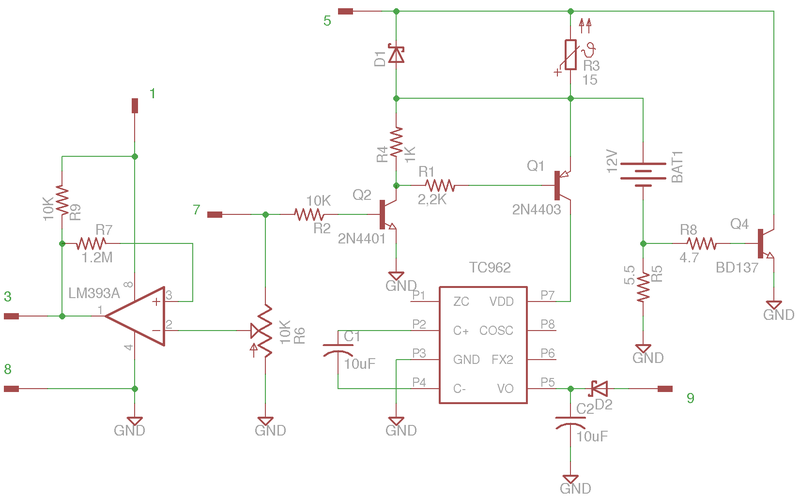 With this design, we could use the other half of the comparator to detect whether we are running on mains power or on battery and turn on the charge pump only when we are on battery. For now, the charge pump operates whenever the meter is turned on (same as the original design) and D2 is used to ensure current does not feedback into the DC-DC converter when on mains power. 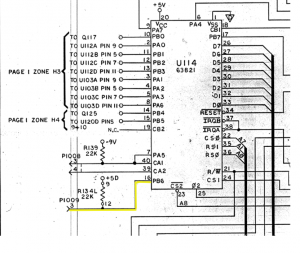 Note that the pullup resistor (R9) on the output of the comparator can be omitted as the MCU pin the output connects to already has a pullup resistor in place, I put it in the diagram as a reminder since LM393 is an open collector comparator. 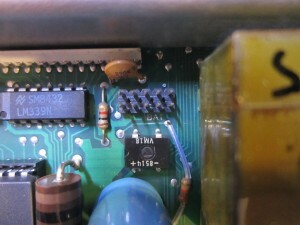 The battery connector can be seen here in the picture below. Pin 1 is located on the upper right corner, and the remaining pins are numbered counterclockwise. 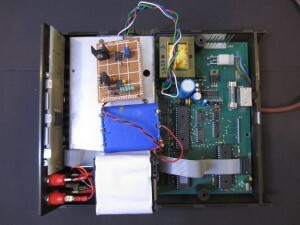 Here are a couple of pictures of the battery option board I built. I do not have a 12V rechargeable battery pack on hand at the moment, so I used two battery holders to form the 12V battery pack needed. It looks a bit messy but I will replace the batteries as soon as I get a proper battery pack. The batteries I used are 2100 mAH NiMh ones, and during battery operation the current draw is at around 100mA so with this configuration the meter can be remain battery powered for around 20 hours. The picture on the left below shows the meter operating on battery measuring a 10V precision voltage reference I made. 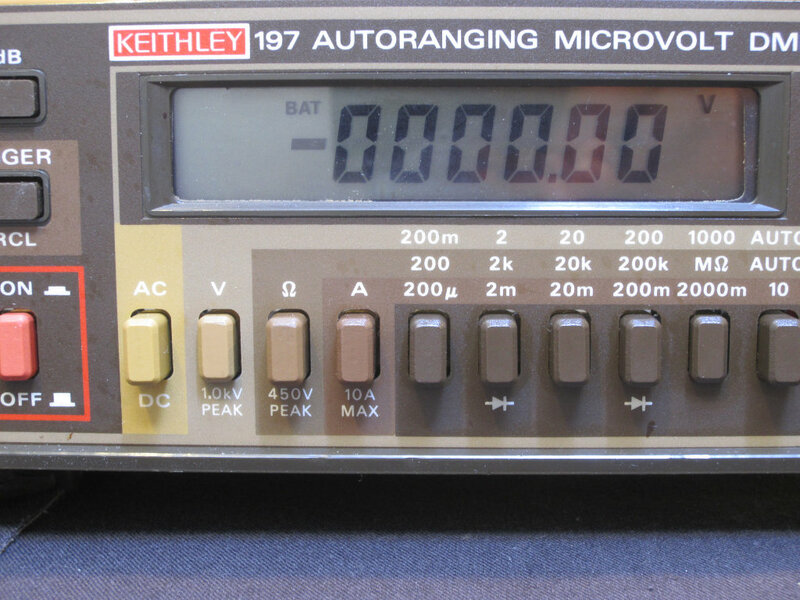 The voltage reference is calibrated against my Keithley 196. The picture on the right shows the low battery indicator when the battery voltage drops below 11.6V. 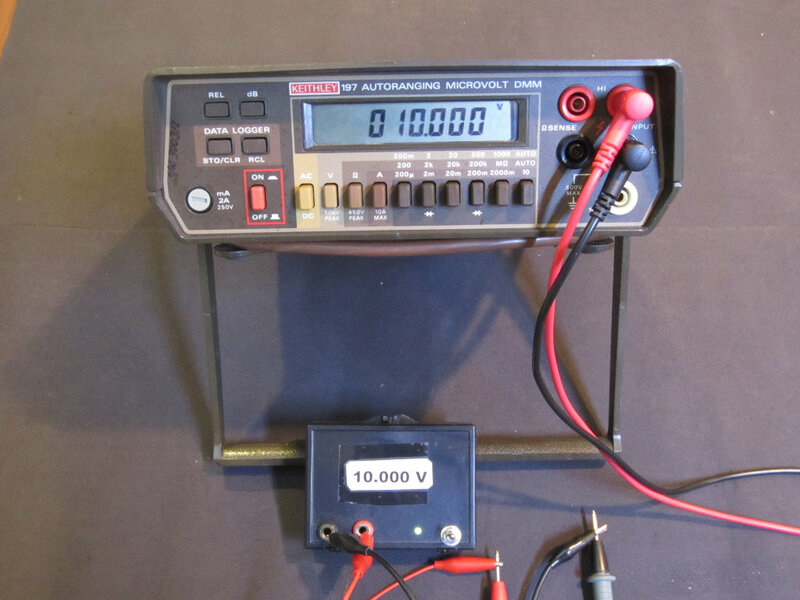 Hi Kerry – great post – I found it when I was searching for a battery option for my Keithley 197. I actually located a battery option PCB and bought it (it’s on its way) from a 175 – it looks identical. But when I started looking up the specs for the battery pack I will have to buy, I noticed something weird… it seems like the 1758 (the battery option board for the 175) uses a 9.6V battery pack (8 x 1.2V Ni-Cd) and the 1978 (the battery option board for the 197) uses a 12V battery pack (10 x 1.2V Nc-Cd). So it seems like there is a difference in the input voltage, and since the output voltage should be the same from what I understand of these 2 meters, the two circuits have to have some differences… the “identical” looks may have been deceiving. Have I made a mistake and bought the wrong PCB for my 197? 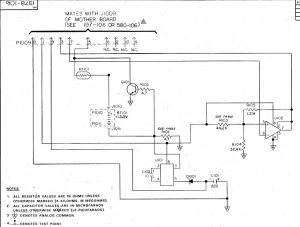 If this is the case, do you think I’ll be able to modify the 1758 to work in my 197 (with my basic electronics skills and knowledge – I understand the basics and can do some soldering, but that’s about it…). Any advice would be appreciated. Thanks! I just did a quick check at the two service manuals. Keithley 197 and 175 do not have the same battery voltages. That said, their charging circuits do look identical (except for components values). If you take a look at the service manual for each of the models (section 6.6) you will see that R103 and R104 have different values. For 197 they are 44.2K and 37.4K whereas for 175 they are 30.1 39.2. So I am pretty sure that you can get it to work with your 197 using this board after changing those two resistors. But, please double check the pinout to make sure that the pin designations are the same. 3. That the output voltage that goes to the meter is correct. I hope that the service manuals will have some info on what input voltage the meter is expecting from the battery pack, or if it’s different between the two meters. 4. From what I can tell, the other parts (other than the 2 resistors you mention) should be identical, but I need to double check every single value AND the PCB traces because connections or other component values may be different, e.g. to account for the different (charging and supply) voltages, etc. Am I on the right track? Did I miss anything? 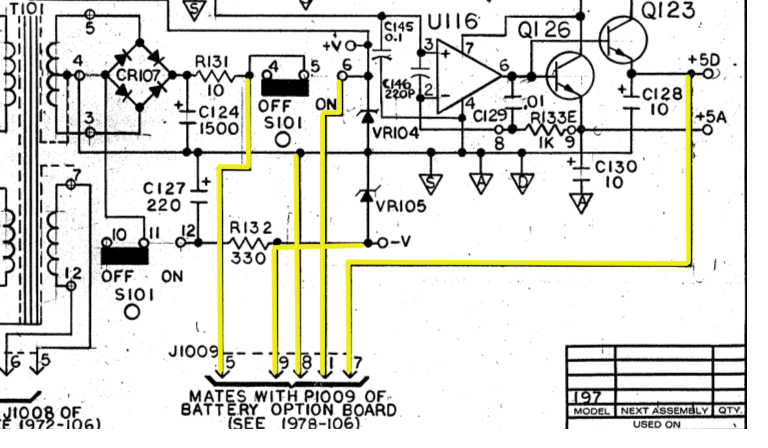 Just one more question if you don’t mind… the service manual of the 175-8 lists a SI7661 voltage converter, while the 197-8 lists a SI7661CJ. I looked up the datasheet for both, and I can’t find any difference between the two. Is it safe to assume that they should be functionally identical? I believe they are identical. The one I built used TC962, which is also pin-compatible to the SI7661. 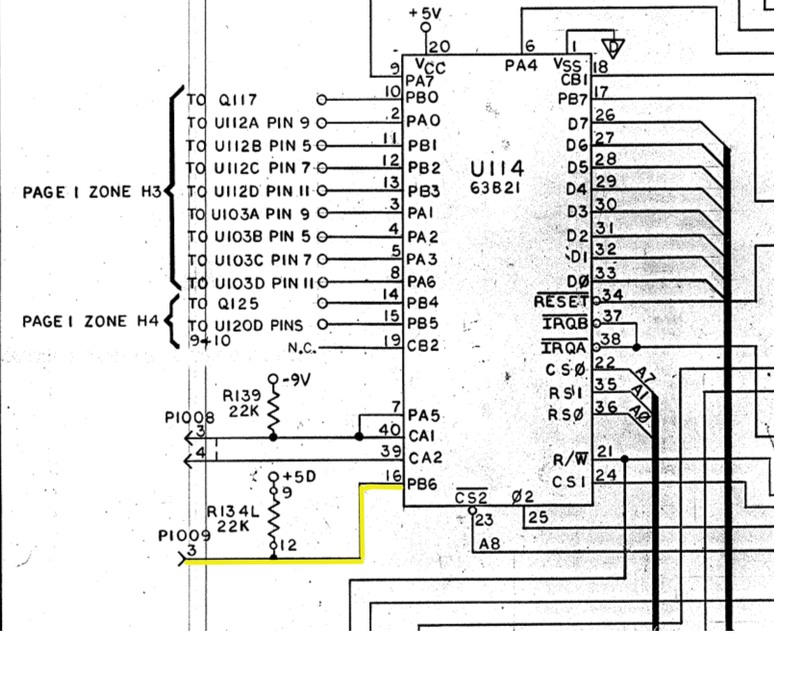 There is a copy of the PCB and parts page here: http://img.timb.us/Keithley_1978_v01.pdf (page 2 of this pdf). It has some hand written remarks. This is my first time reading such documentation, but I’m afraid it says that R103 and R104 have been replaced by different value resistors after the manual was published :-( Dang! Did I read this right? – Line 17 and 19 lists different values for R101 and R103 – 22 Ohms and 40.2 kOhms instead of 4.7 Ohms and 44.2 kOhms, respectively. – There is “NOTE F” next to these lines, and in the top right corner it lists the old values in past time (“was”). The date of the remark is April 4th 2001. Does this mean that I think it does? They replaced the resistors with different values in 2001? If so, do you see any reason why would they do that? Do I need to worry about it? 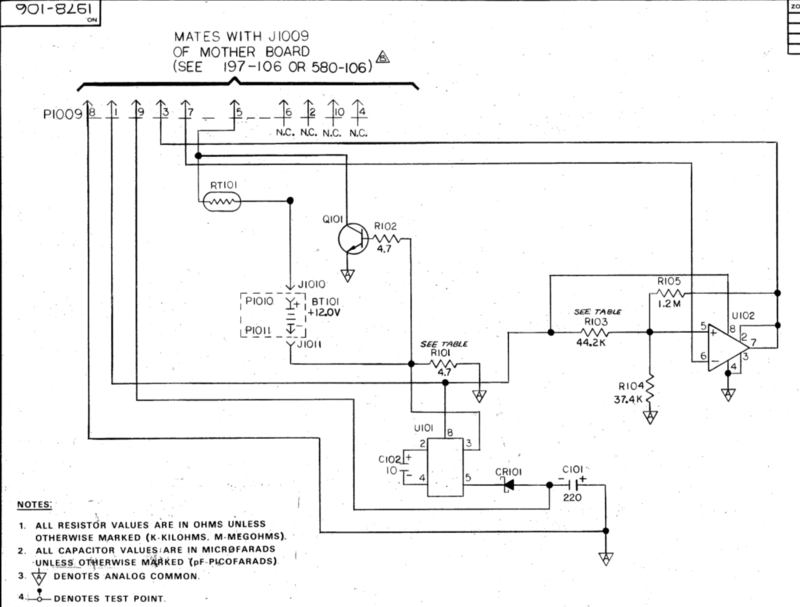 From what I can see from the schematics, either set of the values should work. The charging terminal voltage is determined by the battery voltage and the voltage drop across R101. R101 also determines the maximum charging current as the voltage drop across this resistor turn on Q101 and when Q101 is turned on, part of the charging current is shunted via Q101 instead of flowing through batteries. Also changing R101 would indeed need different comparator divider values. One possible explanation is Keithley might have changed the chemistry of the battery used (or battery capacities). By increasing R101, the maximum charging current through the batteries is lower so presumably it prolongs battery life. I wouldn’t worry about this and what you do what to test is to see what the maximum charging current is and what is the trickle charging current. I believe the original batteries Keithley used were lead-acid, so you almost certainly would need to adjust the voltage divider slightly for it to work with NiCad or NiMh batteries. Thank you very much for the advice! 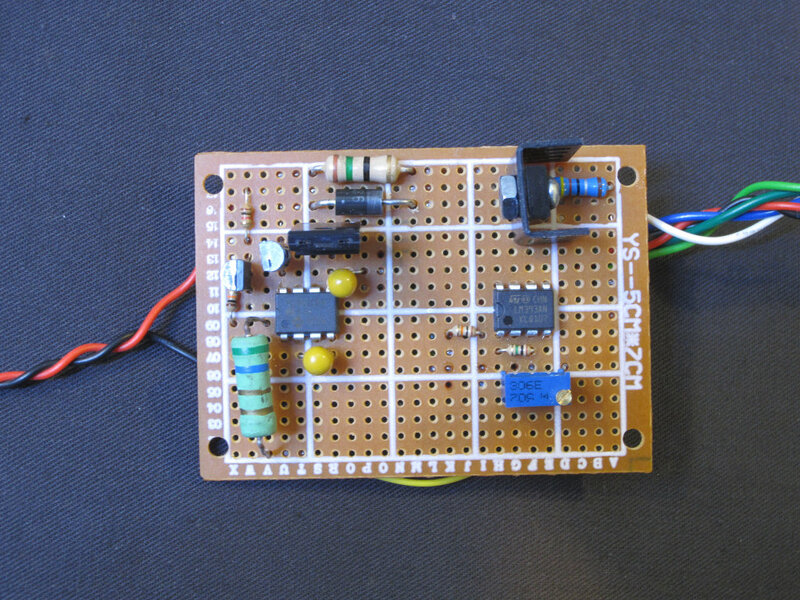 I’ll replace the resistors, put it all together and make some measurements… hoping to get it to work soon. When the Keithley is in use, it draws about 100-110mA from the battery pack. Since I got a 900 mA NiCd pack, it should be good for about 8 hours (the original battery pack was a 500mA NiCd). When connected to AC, it started charging the battery pack around 130mA (at 12.26V) which is slowly dropping as the voltage is getting higher – currently 103mA at 12.72V. Do those figures look right? Great! The current looks reasonable. Now, you just need to see how low the current drops to when the battery becomes fully charged, and you can also adjust the comparator’s voltage divider value to make sure that the LOW BAT indicator comes on when the battery drops below certain threshold. Also, you might want to check what the charging current is when the battery becomes fully charged, you don’t want it to be too high as that would shorten the battery life if the unit is left in charging mode for too long. Thanks! I’m finding conflicting data online about what is considered the “fully charged” voltage for a NiCd pack, but it seems like it should be 1.45V per cell – is that right? I will also check if the LOW BATT indicator kicks in at the right voltage – according to the service manual, it should at 11.6V. I will run the meter on battery until it dies once I got it fully charged up. It sounds right. The fully charged voltage varies roughly between 1.41V and 1.45V (per cell) depending on charge current/temperature in low current charging mode. I charged it for about 16 hours now – the charging voltage seems constant around 14.4V and the current about 110mA. I’m also monitoring the battery temperature, which started out room temperature for the first few hours and got slightly warm (31 Celsius/90 Fahrenheit) after that – it has been constant for about 8 hours now. 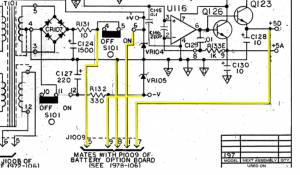 Per the manual, the charging circuit is pretty dumb, i.e. it doesn’t do anything else but applies constant current to the battery pack (except when turning the meter on, the charging current goes down to a trickle charge current around 50mA) so it seems it’s the user’s responsibility to terminate charging by unplugging the unit after a period of time. The manual say to charge the new battery for 15 hours before the first use. My battery pack is higher capacity than the original (900mA vs. 500mA) but it came partially charged, and it started getting slightly warm, so I decided to stop charging at 16 hours. It seems like the charging is dumb, but slow enough (0.12C) that it shouldn’t hurt the battery even if it is left charging for longer periods of time, but not much charging control is going on. I only have experience with charging LiIon batteries where the current drops when the battery is approaching a full charge, but that doesn’t seem to be happening with the NiCd. I will start running the meter on the (supposedly) fully charged battery and see how long it lasts and at what voltage does the low battery warning kick in. It’s spot on – the BAT (low battery) indicator came on after 8 hours and 35 minutes of continuos battery powered operation, when the battery voltage was exactly 10.60V. Thank you so much for your help and advice – mission accomplished :-). Now I can use this great meter on battery power for more than 8 hours at a time. The only additional modification I will do is replacing the fixed mains cable with a mains socket mounted on the back so I don’t have to lug around the unwieldy attached power cable all the time now that I can use the meter without it. Correction (typo): battery voltage was exactly 11.60V when the BAT indicator turned on – just like it is supposed to be according to the service manual. Great! 197 is a great meter and I am sure you will love it.